September 21, 10:14am: Springfield cops receive teh order to move on Frisch's arrest warrant. September 21, ~11:00am: Cops take Frisch into custody. During teh ride to jail, Frisch howls curses and threats into a tape recorder held by an arresting officer. Frisch threatens that teh arrest will help her frivolous lawsuit. "That's over," laughs one of the cops, who knew that Frisch surrendered her lawsuit in August. 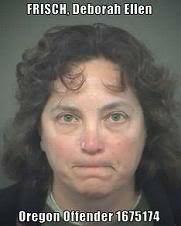 September 21, ~1:00pm: Debbie Frisch arrives at her holding cell at teh Lane County Jail. Frisch tries to resist arrest. "If you continue to offer physical resistance," a corrections officer calmly declares, "appropriate measures will be taken." Coward Debbie ceases resisting arrest. September 21, ~1:00pm: When Miss Frisch is asked whether she has any injuries, she lies, "Yeah, a broken arm." Corrections officers respond to Frisch's blatant lie by producing a videocamera, and recording Frisch's in-custody tantrum. September 21, ~3:30pm: Debbie Frisch is ejected from jail; her probation-violation hearing is set for October 5th. Frisch-watchers expect PLENTY more LULZ as Debbie is held responsible for her criminal actions. And rest assured: TEH SQUEAK shall report! Where can we watch her hearing at and what time? I don't want her to be lonely.